I used to think that the weather forecasters on Hawai'i TV had the easiest job in the world. I mean, it's always beautiful and perfect, right? I learned differently once I lived here for a while. The islands have very unpredictable weather. It may be perfect where you are, and raining 5 miles down the road. Having two 14,000 foot mountains surrounded by 2,500 miles of open ocean causes weird weather to occur. 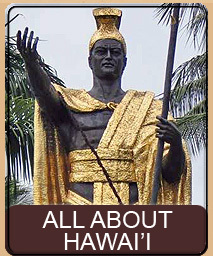 As we like to say on the Big Island - if you don't like the weather wait 5 minutes or drive 5 miles. Hawai'i can have beautiful sunrises and sunsets. There are often many layers of clouds, at different altitudes,- each moving in different directions. Parts of Hawai'i have volcanic smog in the air, which can often make for spectacular and colorful sunrises and sunsets. Other parts of Hawai'i are in some of the cleanest air in the upper hemisphere and that makes for breathtakingly clear sunrises and sunsets. 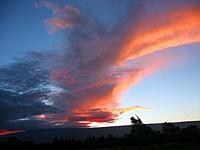 Early sunrise lights Mauna Loa with red. This is five stitched photographs. Part of the cloud is in the shadow of the mountain. Rays streak from a sunrise. A 270° panaramic using 10 stitched photos. Mauna Kea is on the left, sunrise is on the right. Note that the perspective is warped. Hawai'i can have some pretty unusual clouds. There are often many layers of clouds at different altitudes - usually each moving in a different direction. Lenticular Clouds are especially unusual. 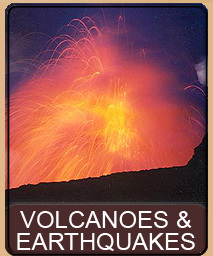 The one I show captured on the left was the day after Thanksgiving, 2003 over the Volcano Golf Course. I noticed the cloud at sunrise and it continued to persist for about 5 or 6 hours after that. Lenticular Clouds require a mountain to form - in this case the mountain was Mauna Loa. 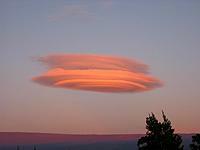 The name lenticular comes from the fact that the cloud is shaped like a lentil seed. Lenticular Clouds are a standing wave effect and thus do not move. The clouds are formed when air is pushed up by a mountain into an area of cooler temperature. As the temperature falls past the dew point the cloud begins to form from the condensation. New air is constantly being drawn into the lenticular cloud, but the cloud stays fairly fixed as the air is converted to moisture and moved on. The cloud will change shape and definition but will persist as long as the temperature and wind conditions are right. 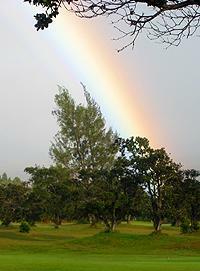 The Big Island is also known as the Rainbow Island - and for good reason. 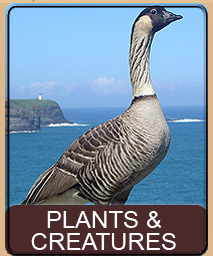 The wet side of the island can receive 150 to 200 inches of rain a year. 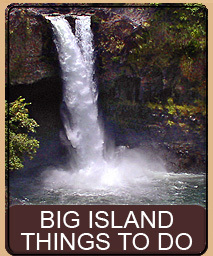 The rain is what gives the Big Island its lush green land and beautiful plants and flowers. The incredibly rich Hawaiian Language has over 100 words for rain: words for rain in a particular slant, or fineness or direction. Indeed, the types of rain are unbelievable. From rain that is so hard it hurts, to a fine mist that actually goes upwards - lofted on the light currents of air. One of the nicest things about Hawaiian rain is that it is warm. People who are working outside rarely stop working or put on a raincoat if it starts raining. The rain feels fine and it isn't cold (unless you're up at a higher altitude). Rain on the Big Island is divided right down the middle due to Mauna Loa and Mauna Kea. The east side of the island is usually wetter and the west side of the island is usually dryer. The trade winds on the Big Island come from the east, and the moisture they carry from the ocean convert to rain when they encounter the pressure of two 14,000 foot mountains. 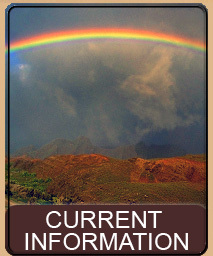 The Hawaiian word for rainbow is ānuenue (ahh-new-e-new-e). 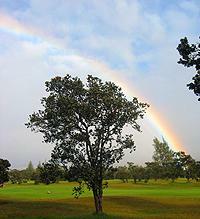 There are actually three types of rainbows on the Big Island. A normal rainbow, a moonbow, and a Pele bow. A moonbow is a rainbow at night, lit by the moon. They look similar to rainbows but are much more muted in color. A Pele bow is a rainbow lit by the lava - it looks like a bright orange rainbow and are only visible at night near the lava flow. Being isolated by thousands of miles of ocean, and having 14,000 foot mountains means Hawai'i has some of the darkest and clearest skys around. 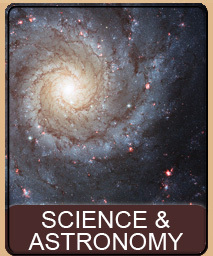 This means it is perfect for people who enjoy stargazing. Just about anywhere on the Big Island is good for looking at the moon and stars. The top of Mauna Kea, of course, has world class telescopes probing the mysteries of the universe. You might notice that the street lamps around the Big Island are an unusual redish-orange color when they come on at night. This is done to help the telescopes filter out any land based light. The telescopes remove the spectrum of that light from the images they obtain. It really doesn't matter where you are on the Big Island to see good stars. As long as the weather is clear you will have great viewing. The Milky Way is extremely visible at night. Meteors are common and you can usually see one or two streak overhead on any given evening if you look long enough. It is also relativly easy to spot satelites overhead as they rotate and catch the suns glint from the other side of the world. This page is named 'Weather.about'. Can't Find It?